Omeo Arthritis is a combination of Acidum formicum, Colchicum autumnale, Rhus toxicodendron, Natrum salicylicum, Ledum palustre, Dulcamara, Lithium corbonicum, Gelsemium sempervirens and Ulmus fulva. Any damage to the joints from disease or injury can interfere with your movement and cause a lot of pain. Many different conditions can lead to painful joints, including osteoarthritis, rheumatoid arthritis, bursitis, gout, strains, sprains, and other injuries. Joint pain is extremely common. Omeo Arthritis acts on periostium and synovial membrane of the joints, corrects uric acid problem tendency and relieves gouty attacks. It also acts on fibrous tissue markedly joints, tendons, sheath, aponeurosis. 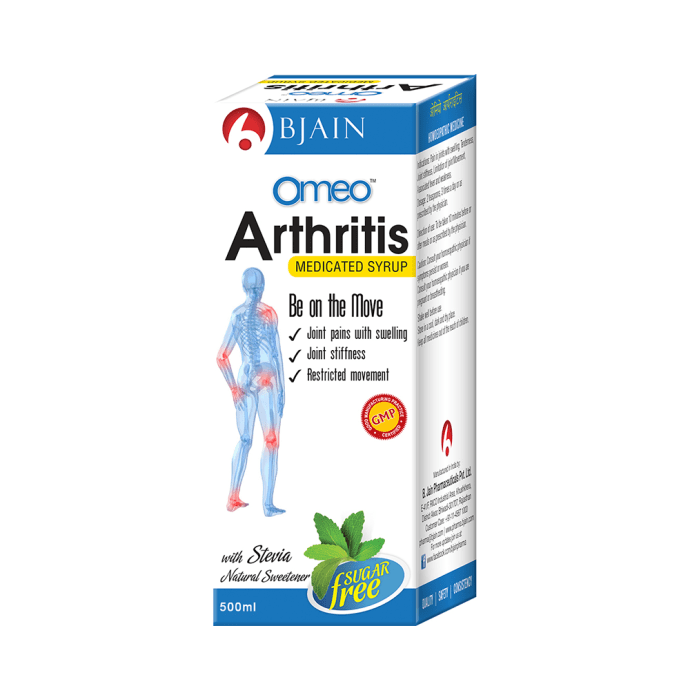 Omeo Arthritis is recommended for pain in joints with swelling, tenderness muscle stiffness and limitation of joint movement.